Cecilia Tiepolo circa 1770. This pastel portrait by son Lorenzo is one of only two known portraits of her. It didn’t surprise me that there was so little information available on Cecilia. Before I started researching the novel, I knew that 18th century Venetians were not a highly literary bunch. Many were illiterate. Only a few wealthy, educated women and men, like my narrator Francesco Algarotti, and certain Enlightenment upstarts, like Giacamo Casanova, left substantial bodies of correspondence, books or other written records. Detail from Tiepolo’s Banquet of Cleopatra, 1743. As a female born to poor parents and married to a painter, even a phenomenally successful one like Tiepolo, Cecilia’s paper trail was bound to be thread-thin. In fact, the sum of what I found amounts to little more than some birth, death and marriage entries in church registers, a few court records and a simple will. 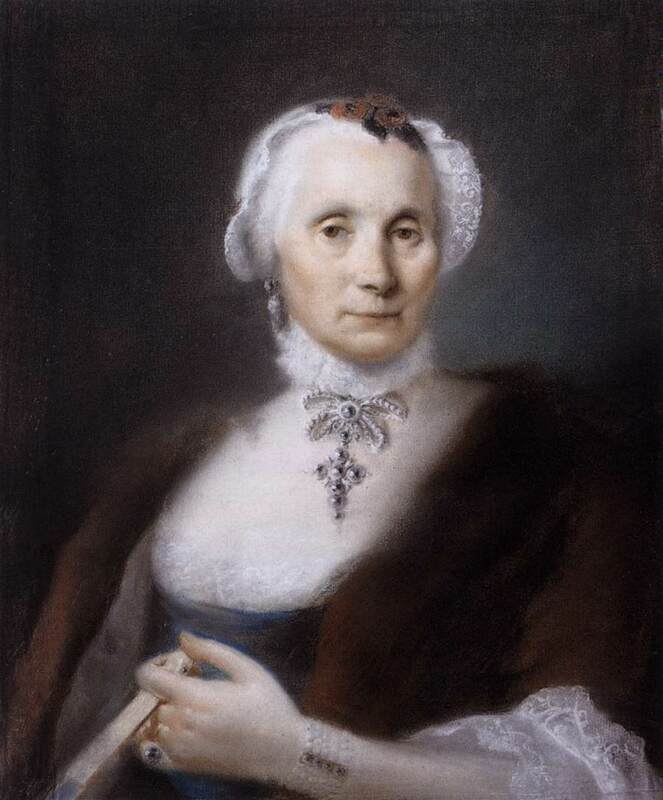 1703: Maria Cecilia Guardi is born in Venice to Domenico Guardi, a painter, and Maria Claudia Pichler, both of Mastellina, a town in mountains of the Trentino. She has three surviving brothers: Antonio Guardi, Francesco Guardi and the youngest, Nicolo Guardi, about whom little is known. All were painters working in Venice. 1719: At 16, she marries Giambattista Tiepolo in a secret ceremony in Tiepolo’s local church, San Ternita. Over the next 17 years, she bears Tiepolo 11 children. Four die in childhood; seven survive into adulthood, including the painters Domenico and Lorenzo Tiepolo. 1770: Giambattista Tiepolo dies suddenly while working for King Charles III in Madrid. 1779: Cecilia dies in Venice of “pulmonary failure” at the age of 76. 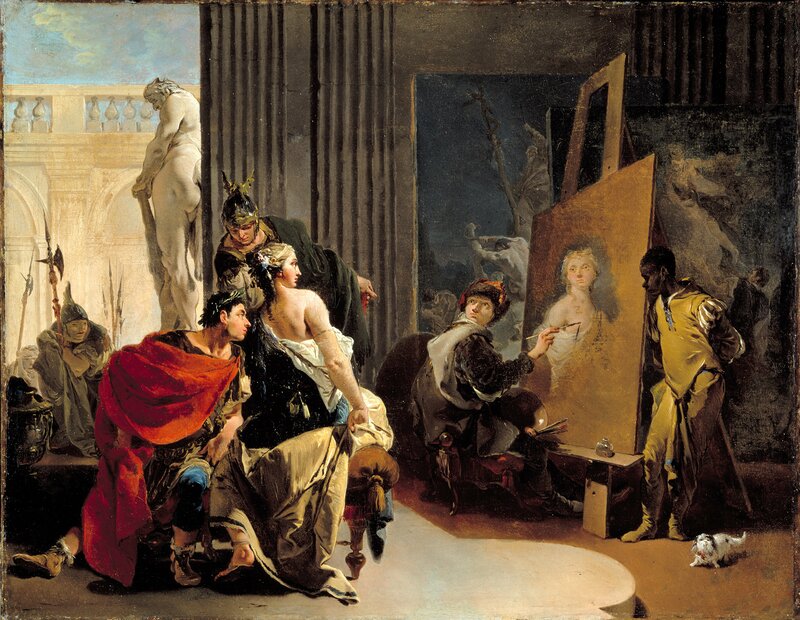 Apelles Painting Campaspe by Giambattista Tiepolo, circa 1725. This tongue-in-cheek painting features a self-portrait of Tiepolo as Apelles. The scarcity of hard data on Cecilia didn’t bother me. It would have been a disaster for a historian, but for a novelist, lack of information can be a kind of gift. I absorbed what facts there were, most of them uncovered for me by art historians like Michael Levey and Urbani de Gheltof. Then, duty done, I turned to the gossip. The juiciest tidbit about Cecilia comes to us from an 1883 entry in the Journals des Goncourt. These literary diaries, penned by brothers Jules and Edmond Goncourt in Paris, are full of spite, envy, character assassination, literary name-dropping and scurrilous gossip. The story about Cecilia is much in this spirit. One night, she (Cecilia) lost a great deal of money (while gambling). Her partner in the game said to her: ‘I will wager everything you’ve lost so far against the sketches by your husband you have at home.’ She played, and lost. Then the winner said: ‘I’ll wager everything you’ve lost so far against your house on terra firma (presumably Zianigo, the Tiepolos’ villa on the mainland) and the frescoes it contains.’ …The woman played again and lost. This happened while her husband, who had been called to court in Spain, was in Madrid. Allegory With Venus and Time by Giambattista Tiepolo, around 1755. As you can imagine, I was delighted to unearth this dirt on Cecilia—and grateful to the art historian, George Knox, for passing it along like an excited schoolgirl. The story probably isn’t true. (How far can you believe someone calling himself Rogier l’Égyptien?) But, true or false, it hardly matters. What does matter is the way this tale sparked my imagination. It gave Cecilia’s character, which had until then been something of a blank for me, new dimensions, contradictions, possibilities. Through a mysterious process of creative assimilation, it ultimately worked its way into the plot of The Merchants of Light. 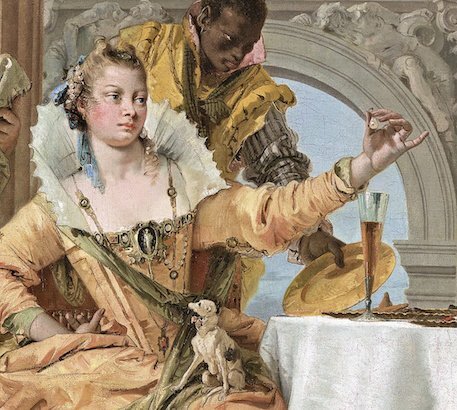 In its pages, gossip lives alongside the verifiable facts about Maria Cecilia Guardi Tiepolo, proving again that novels, like real life, rely on both for interest.